I grew up backpacking in the Rockies. I hike ranges throughout Arizona and Colorado year round. I carry a light pack, mostly water. I prefer a tarp shelter to my heavier 2-person tent. I do many day hikes and I also spend as many as 5 days out at a time. Temperatures range from below freezing to above 100 F (38 C), and elevations from 2,000 ft to 14,000 ft ( 610 m to 4, 300 m). I bag a mountain almost every weekend, and I walk my dogs 4 miles daily through deep sand and overgrown mesquite trees in our local washes. 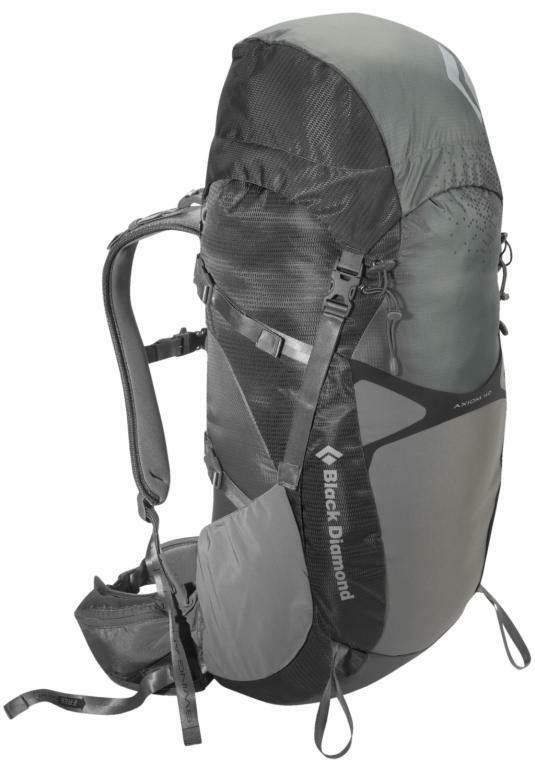 The Black Diamond Axiom 40 backpack is a lightweight aluminum framed pack that the manufacturer claims is for going superlight without feeling too exposed. The pack is topped with a removable pocket that clips onto two compression straps on the front and two on the back. The zipper of the top pocket runs about 10 in (25 cm) over a curved opening that allows easy access to the entire pocket. I think that the curved shape of the zipper gives me good access to the pocket, better than if the zipper went straight across. The Black Diamond logo is located in the lower right corner on the front of the pocket. With the top pocket flipped back, I notice that the opening of the main compartment of the pack is a roll top design that gives about 12 in (30 cm) of added height when completely unrolled. The top seam on the opening is composed of a strip of firm plastic measuring approximately 1in by 20 in (3 cm by 51 cm). This strip adds the strength needed for me to roll the compartment up and down quickly and effectively to many desired levels. I was surprised and impressed at the size of this pack after I unrolled the main compartment and looked inside. As I look into the main compartment I notice that I can stick my entire arm up to my shoulder into the pack. I measured about 34 in (86 cm) of possible loading height in the main compartment. It has basically 3 ft by 1 ft (91 cm by 30 cm) of total loading capacity. It looks like I will be able to cram a lot of stuff into this pack which is great because I plan on taking extended backpacking trips while testing the pack and I will need all the room I can get. On the front of the pack there is a stretchy pocket that can be adjusted with compression straps. I am sure I will find this to be a useful feature in the months to come. The pocket is about 14.5 in (37 cm) wide at the opening. It gets thinner towards the bottom. The depth of the front pocket is about 11.5 in (29 cm). The pack's name Axiom 40 is printed on the top band of this pocket, and the Black Diamond name is printed vertically down the left side. The axe/hiking pole loops are located just below the front pocket. There are two side pockets on the pack. They are made of a stretchy material and seem to hold my 1000 ml (34 oz) l water bottles decently tight. I notice that there is a strap near the top of these pockets that I assume is to assist in keeping my water bottle secure and/or securing extra gear to the area. Both of these straps look to me like they could also be used in unison with the compression straps from the front pocket mentioned above in order to secure extra gear to my sides. I am very happy with the amount of straps on this pack. The hipbelt clips together in the middle of my stomach and has two pockets. The pockets seem to be of decent size. I like that they are not see-through mesh fabric but a solid tough nylon material. The sternum strap clips together in the middle of my chest and has a built in whistle. The strap can easily tighten and loosen to accommodate my needs. It can also adjust vertically up and down my chest. The entire pack seems to be made of some very tough feeling nylon fabric. I wish that it was waterproof since there is no rain fly on the pack. I will probably carry some lightweight plastic or something to keep the pack dry in case of rain. I loaded the pack with everything I would need for a two night trip. The difficulty in Southern Arizona is the amount of water I need to carry. I am close to being a lightweight backpacker when I hike areas that have running water, but my next couple of trips will not have that luxury. Due to some older gear and my water weight, I will be carrying about a 28 lb (13 kg) pack. I can knock off about 11 lb (5 kg) easily if I drop the extra water. My immediate concern is that the hydration bladder is literally floating in the main compartment of the pack. I am honestly scared that it may get punctured or it may explode due to the pressure from all the gear that I will be stuffing against and around it. I feel a little better hanging it backwards to limit the stress on the hose connection at the bottom of the bladder, but I really wish there was just a separate pocket to protect the bladder. The pack feels great on my back. I like how comfortably the 28 lb (13 kg) load is distributed from my hips to shoulders. I am very happy with the ease of adjusting the straps on both the sternum and hip belt. I noticed that the shoulder straps have markings on them that help me to easily keep a balance between the two while tightening and loosening. The lightweight frame is holding its shape and giving me a level feeling to the pack. When I loaded the pack up to test the feel, I was the most curious about the suspension that Black Diamond has a patent pending on. It supposedly will move with me and give me a more comfortable experience. I danced around the house a bit with some bluegrass on the radio, and I felt the pack moving with me. Wow! I have not worn a pack with this sort of technology before and as of now I am impressed. 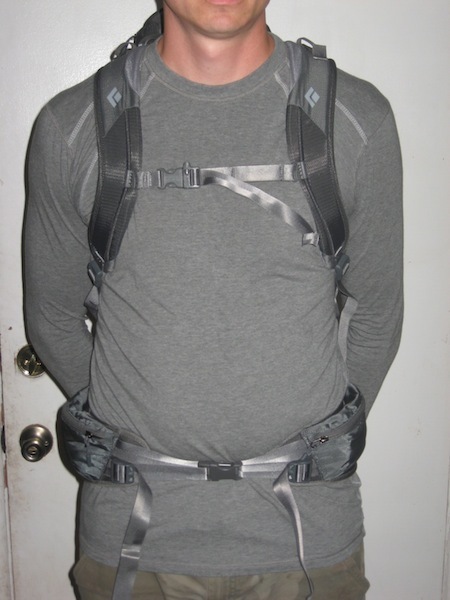 Both the shoulder straps and the hip belt move to create a pleasant transfer of weight while I move. Certain things like bending down to tie my boots is still a pain with the weight on my back, but while walking, jumping and dancing it seems to move with me like no other pack I have used. So far I like the size and comfort of the pack. I also like that the pack itself is lightweight. It holds a good deal more than I had expected which is great. I can carry everything I need for my upcoming two night trip with some room to spare. There are a lot of compression straps on the pack with lots of extra slack that can be useful for strapping on extra gear. All of the straps are really easy to adjust and move smoothly. So far I think the pockets are sufficient. I haven't figured out how I am going to fill the whole thing up yet, but I am sure it will come to me in time. I am concerned for the safety of my hydration bladder as it floats undefended in the main compartment of the pack. I will have to see how well the design works, as I may just be worrying about nothing, but time will tell. 1. Bigger than I expected. 2. reACTIV suspension feels like it will make for a comfortable ride. This backpack has been on at least ten excursions with me, a few of the trips are explained below. I wore the Axiom during a 3-day 2-night trip in Coconino National Forest in northern Arizona. The elevation ranged from 8,400 ft to 12,637 ft (2,560 m to 3,866 m) and temperatures ranged from 32 F to 65 F (0 C to 18 C). 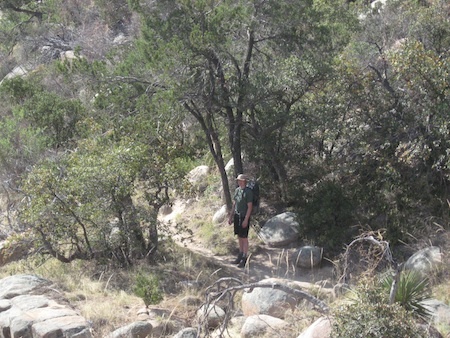 The Axiom came with me on a 2-day 1-night trip in the Santa Rita Mountains south of Tucson, Arizona. The elevation ranged from 5,400 ft to 9,453 ft (1,646 m to 2,909 m) and the temperatures ranged from the low 50s F to the mid 70s F (low 10s C to mid 20s C). The Axiom pack has been through a lot these past two months. I have loaded it to its weight capacity of around 40 lb (18 kg) for multiple day trips in the arid Sonoran desert. My water weight alone stood near 25 lb (11 kg). 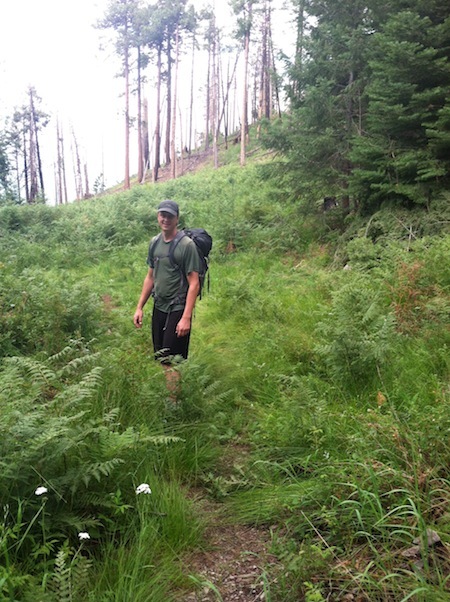 I am impressed by how well the pack handles heavy weight while hiking. This is my first experience with the reACTIVE suspension system and I think it is exceptionally good at handling and distributing weight while I'm off balance. I have also used the pack as a summit/day pack on Mt. Humphreys, Mt. 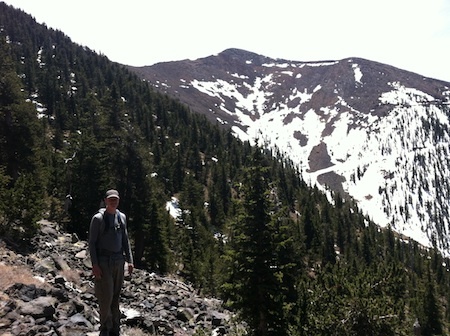 Wrightson, Rincon Peak, Cathedral Rock and a number of other named and unnamed peaks. As a summit pack my weight was around 6 lb (3 kg), and as a day pack it was at 10 to 15 lb (5 to 7 kg). For hikes where there were cool temperatures of 32 to 65 F (0 to 18 C) and the chance to find running water, my weight was around 18 to 22 lb (8 to 10 kg). 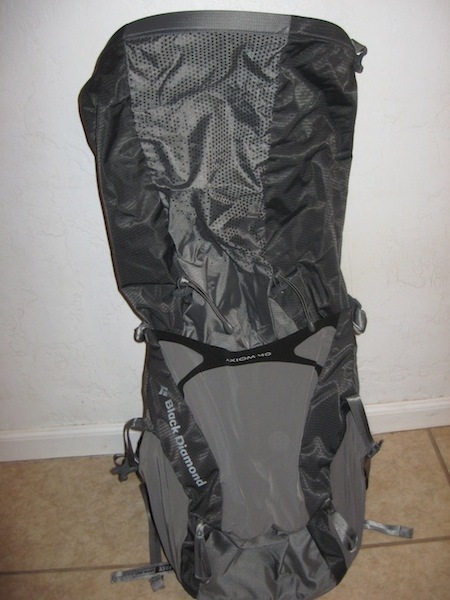 As a summit pack, the Axiom is a bit overkill, but the pack is light enough that the size doesn't bother me at all. 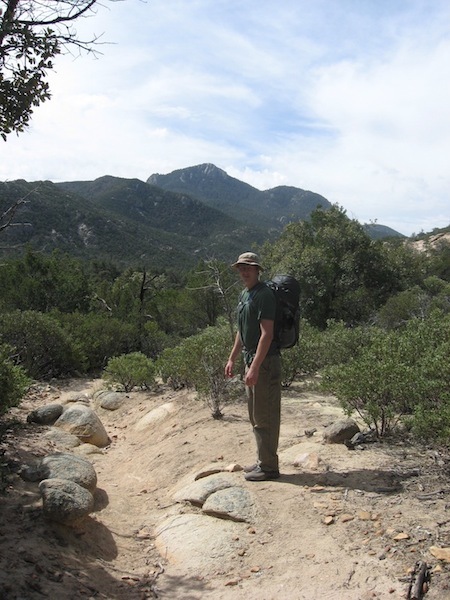 I climbed over 4,000 ft (1,219 m) in just 6 miles (10 kg) carrying about 40 lb (18 kg) in the Rincon Mountains. I had expected my back and shoulders to be sore and tight but when I got to base camp other than jelly legs, I was surprisingly fresh. The reACTIVE suspension moved with my every step throughout the steep climb. The pack stayed tight to my back, it didn't shift off center or slide around on my shoulders regardless of how off balance I was. This was an impressive feat in my opinion. Most packs I have worn carry weight well while standing up straight, but become difficult to manage when leaning off balance. I sometimes feel like I'm about to lose the load off to my side. The Axiom seems to recognize that I am off balance and it compensates accordingly. The hip belt rests right on the top of my hips, not too high or too low, allowing for great weight distribution and comfort. The roll top design of the main compartment is great! It allows me to store many different sized loads without feeling like I'm overloaded or like I have a large empty space at the top. I am not a fan of hanging items off my pack, and the roll top allows for lots of space in a deceivingly small package. I also like how when rolled down tightly, the top adds strength to stabilize the load. I have filled the pack to the rim of the roll top as well as far below the rim and been happy and comfortable each time on the trail. The removable pocket on the top of the pack has become the place where I store all my small items such as a compass, matches, fire starter, snacks etc. I have found this is the best pocket for the small stuff since it is the only pocket with a zipper. This can also be a negative feature because if I want to take the lid off to decrease my weight, I lose the only pocket on the pack that can safely hold onto my small and important items. The placement of the zipper makes for easy access to the pocket for others while I am wearing the pack. My hiking partner was able to fumble around in this large pocket throughout our excursions with ease. However if the top is flipped down at the time it is opened, everything will fall to the ground. Not too big of a deal, but worth mentioning. As far as the large stretchy pocket on the front of the pack goes, I love it and hate it all at the same time. I feel that it is near impossible to get anything into the bottom portion of the pocket if the pack is loaded. Although two compression straps allow for greater access to the top portion of the pocket, the bottom doesn't expand near as much if at all. I can barely even get my fingers into the bottom of the pocket if the pack is loaded. That being said, I love how much space the top portion of the pocket has. I generally stow my map, a space blanket and whatever other essentials in this pocket that aren't so small that they need to be placed in the top zippered pocket. I also use this pocket for stuffing different layers of clothes as I shed them throughout the day. The compression straps and the stretchy material give the top portion of this pocket the ability to hold a lot of stuff. I feel that my things are always very secure due to the compression straps cinching down tight. However I don't feel comfortable putting anything small into this pocket in case things were to slip out when I toss the pack on the ground during breaks. I generally use the side pockets to store my two 2 L collapsible water bottles. I also occasionally use them to store a beanie and gloves for easy access while in cool weather and wind. I have had no trouble with any of these items falling out due to the compression straps near the top portion of the side pockets that hold things in tight. I did have a little difficulty accessing the water bottles while wearing the pack, but it wasn't much of a concern because I only carry them to refill my hydration bladder. My main complaint about the pack was also a concern that I mentioned in my initial report. Unlike most of my packs that have a separate compartment for the bladder, the Axiom stores it in the large main compartment. There is a hook-and-loop strap that connects to the plastic hook on the top of my bladder, and an elastic strap that fits loosely around the body towards the bottom of the bladder. This is not a problem when the pack is full and the bladder is secured by other items, but when I use the Axiom as a summit pack, or for day hikes the strap fails to properly secure my bladder in place. My initial thought that the bladder could potentially get damaged or burst has thankfully not occurred. In ten years of using hydration bladders, I have never managed to break the plastic hook that the bladder hangs from, but due to the rigorous shaking and swinging about (perhaps doing acrobatics while in the pack), the hook broke off. Now my hydration bladder is basically useless in this pack. Without the ability to hang and with only a loose strap to secure it, the bladder gets all bunched up at the bottom of the compartment and the water becomes very hard to get to. Due to this I have started carrying only a couple of water bottles and leaving the bladder at camp, or at home. I am very disappointed in this occurrence, now I need to buy a new bladder and I am leery of ever putting it into the Axiom pack. Maybe this will turn out for the best, and I will cut the weight of the bladder all together and just go with water bottles, but the convenience of a bladder while hiking is hard to beat. It doesn't seem like an incredibly difficult thing to build a pack with a compartment for the bladder, especially since there are entire product lines of packs that contain them. Maybe I just happened to be the unlucky person that this happened to, but since it did happen I feel the need to mention it in my report. The Axiom Pack has been fun to test so far. I love the versatility of the roll top in that it gives me lots of room to pack many different sized loads. I love the suspension system, it makes this the most comfortable backpack I own. 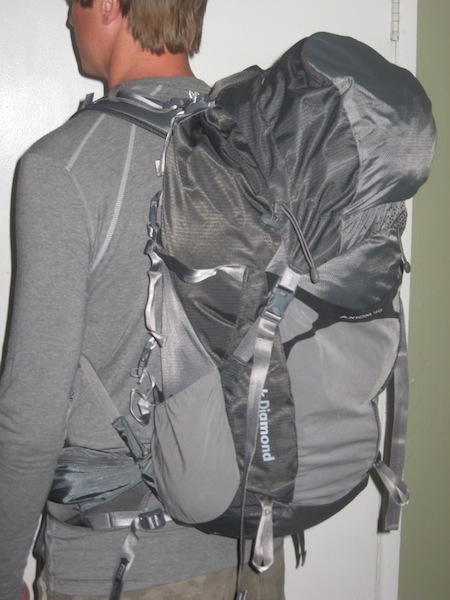 I also like that the pack is lightweight and comfortable for short day hikes and as a summit pack. I have been impressed by how much stuff I can fit into it. The Axiom doesn't look like a very large pack, but it is basically bottomless when I get to loading it. My main complaint is the floating hydration bladder set up that aided my bladder in breaking, but it hasn't slowed me down too much. I look forward to continuing to use the pack extensively during the next two months. 1. Versatility of roll top. 2. Suspension system makes for a comfortable ride. 3. Big enough for multiple nights out yet light enough for short hikes. 1. Floating hydration set up. I didn't get to use the Axiom pack as much as I had hoped during the long term testing period. An injury to my left foot forced me to cancel my Grand Canyon trip, and forest closures in Colorado attributed to the limited use I was able to get while out there. Luckily I had the chance to do some hiking in the northern part of Colorado before coming back to Arizona. I did manage to get in an overnight trip in Roosevelt National Forest in northern Colorado. The temperature ranged from 45 F (7 C) in the early morning to about 80 F (27 C) mid day. The elevation ranged from 7,000 ft (2,134 m) to around 9,500 ft (2,896 m). 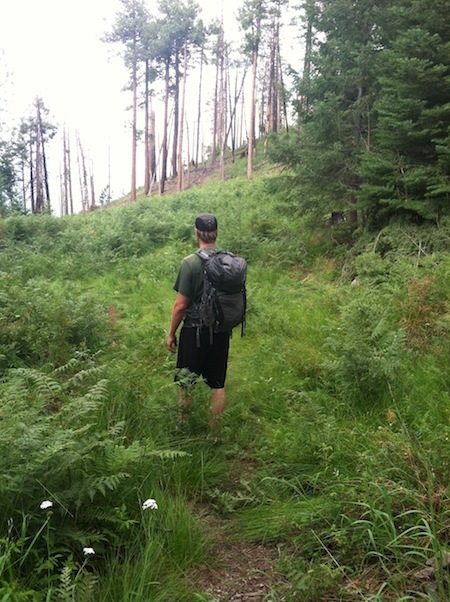 I also carried the Axiom on a few day hikes and an overnight trip in the Mount Baldy Wilderness in northern Arizona. The temperatures ranged from the mid 40's F (4's C) to the mid 70's F (20's C) and the elevation ranged from 9,394 ft (2,862 m) to 11,414 ft (3,479 m). I took the Axiom on 2 overnight trips to the Mt Bigelow area of Coronado National Forest in southern Arizona. The temperatures ranged from 60 F (16 C) to 85 F (29 C) and the elevation ranged from about 7,500 ft (2,286 m) to 8,000 ft (2,438 m). I did not get the chance to summit the peak due to my foot injury, but I did get to enjoy the cool mountain air and even got a little bit wet! This is still one of the most comfortable packs I have ever worn. The suspension system has not faltered over the course of the testing period, it still works just as good as it did to begin with. Finally a pack I can keep on while I tie my shoes without falling down like a drunkard. 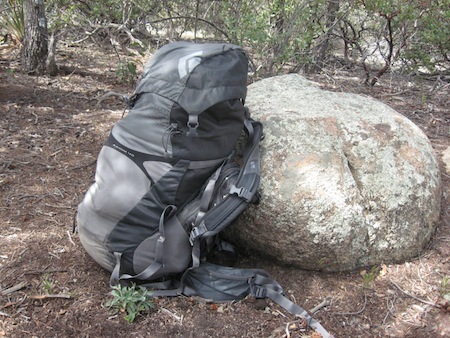 The Axiom successfully distributes the pack weight in all sorts of off balance situations. The size and weight of the pack itself has proven to be ideal for me. It is light enough that I can use it as a summit pack after I set up camp, and big enough to carry all my food water and gear for multiple day trips into the backcountry. The roll top closure makes the pack so versatile as far as how enjoyable it is to carry fluctuating load sizes in. The ability to roll down the top and create a tight fit over large and small loads alike is wonderful. Many large packs can only comfortably be used for large loads, otherwise they feel bulky heavy like carrying a partially loaded appliances box on my back. The Axiom gives me the freedom to bring just one pack whether I am carrying lots of gear or just some water and a snack. The pack is not waterproof, but is doesn't claim to be. Out of habit I tend to line my pack with a thick garbage bag to insure my contents remain dry. On the few occasions where I had the pack in some rain, my trash bag liner had some moisture on the outside meaning that water got through the pack. I wasn't too upset about this, and the pack dried quickly when hung in the sun for a bit. In my Field Report I mentioned that the hook of my hydration bladder had broken while the bladder bounced around in the wide open main compartment where it is built to be stored. I never got a new bladder and I don't think I would have been about to put another one onto the chopping block so to speak. Instead I started carrying collapsible 1 L water bottles. Depending on the duration of my trip and whether or not there would be a dependable water source, I carried up to four of the water bottles at a time. Generally I drank from the bottles that I had stowed in the stretchy side pockets. When they were empty I switched them out with bottles that were stored in the main compartment. My load got a little lighter and a little smaller as the empty bottles were rolled up and stuffed into the pack. I have been pretty rough on the Axiom pack over the testing period. I have tossed it on rocks and dirt, sometimes even in the mud. It has brushed up against trees, cactus and sharp rocks more times than I can remember. I am very pleased to say that when I clean the dust off the pack, it still looks brand new. The Axiom has proven to be a durable pack and I suspect it will remain so for many backpacking trips to come. I really like the versatility of the Axiom pack and I will continue to use it far after this test is concluded. It has assisted to making my backpacking trips enjoyable and comfortable. As much as I don't like the set up for my hydration bladder, I have found myself to be quite happy with carrying the collapsible water bottles instead. The Axiom has won my appreciation throughout the testing period and I have had a great time using it. 1. Comfortably carries large or small loads. 2. Suspension system is great. 3. Large capacity for a lightweight pack. 1. What is so bad about hydration bladder pockets? They seem to fit in many other packs. I would like to thank Black Diamond and BackpackGearTest.org for the chance to test this product!